Although Chevalier House appeared to be a single building, it was two buildings, one dating from the reign of James I and one from Charles I. The older, No. 78, on the left, dates to around the 1610, while No. 79 was constructed about 1640. They were built from well seasoned British oak (Crocker 1886). 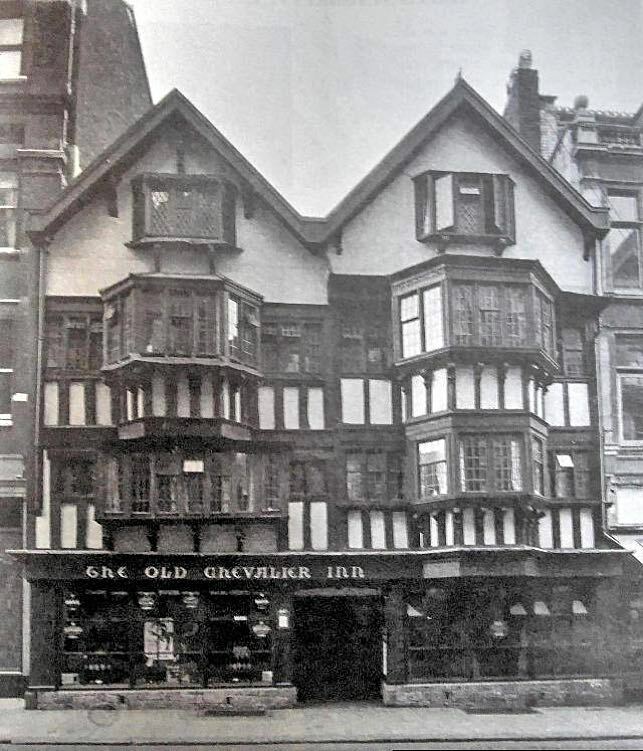 They had projecting oriel windows that jettied out over the pavement of Fore Street, the frames supported on carved oak corbels. The interior rooms of both houses contained panelling, decorative plaster ceilings and stone fireplaces. At some point, a small ceramic equestrian statue was placed on the roof of the right hand house, number 79, which is said to indicate loyalty to the Royalists–however, equestrian roof tiles were made all over Devon and Cornwall at this time, and at least one other survives at Marazion, Cornwall. Victorian photographic evidence shows the building with no statue while a 1910 photograph shows the statue. It is also said that the exiled King Charles II (he had been crowned King of Scotland, in January 1651) sought refuge there, in 1651, after the Battle of Worcester. In fact, the closest Charles came to Exeter when fleeing to France was Castle Cary and Charmouth. Certainly at this time, alternate names for the building was Cavalier or Chevalier House. 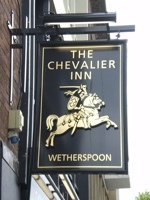 Robert Dymond dates the Fountain Tavern as occupying Chevalier House to 1715, or even earlier, and alludes to the inns proximity to the Carfoix or public water supply opposite for its name. 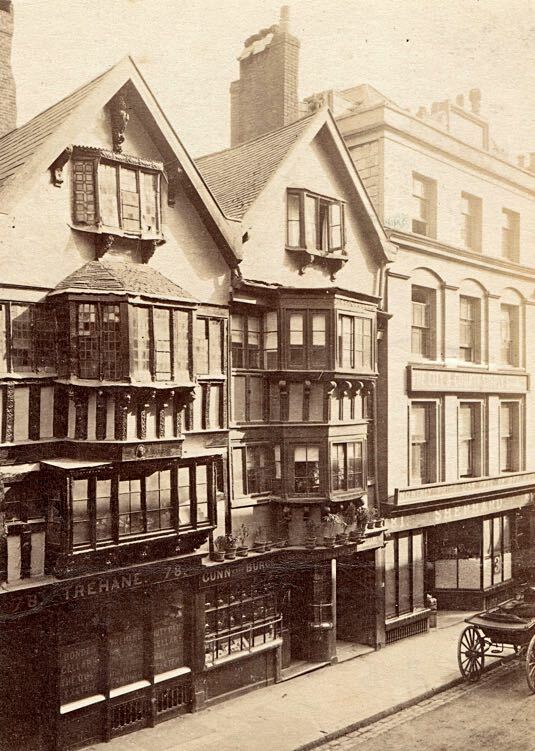 The Carfoix was taken down and relocated in High Street in 1770. A to let notice for the Fountain Inn to Samuel Fley, bricklayer, appeared in the Flying Post of January 1782. In December 1787 a for sale notice appeared in the Flying Post, referring to the former Fountain Inn; it became the premises of Richard Sercombe, a wine and spirit merchant whose family originated from Dunsford. The Sercombes were grocers and salt dealers and remained in Chevalier House for the next five generations. In 1868, John Sercombe died without an heir. 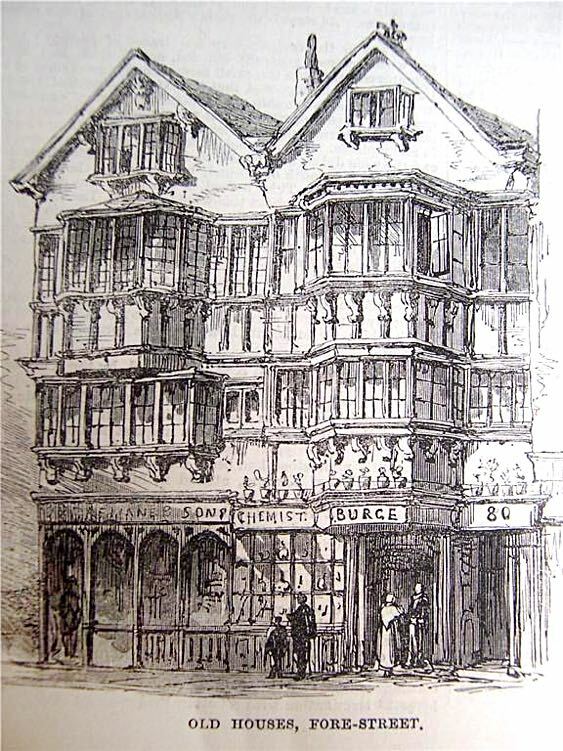 It is interesting to note that the Fountain Inn on the quay was also coincidentally owned by a Richard Sercombe. Samuel Sercombe, the nearest relative successfully claimed the building at the Court of Common Pleas at Westminster on 25 April 1868. Upon Samuel's death, his wife Susannah Sercombe inherited the property and, in turn left it to her son in law, Samuel Shilston. 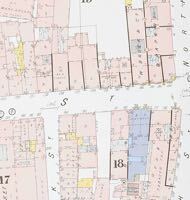 In November 1895, a conveyance was drawn up between Shilston and Charles Ham, a wine and spirit merchant, who had been a sub-tenant with John Trehane prior to 1868. It was sold for £1671 3 shillings, requiring Ham to take out a mortgage for £1,500. 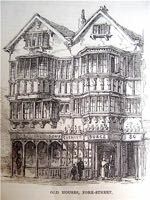 A drawing by John Gendall dated 1850 shows the wine and spirit merchant called John Trehane, on the left of the premises, and a shop called Pitts on the right. Trehane was Mayor in 1867 and great grandfather to Sir Richard Trehane who was chairman of the Milk Marketing Board during the last century. In 1910, No 79 was a wallpaper merchants. 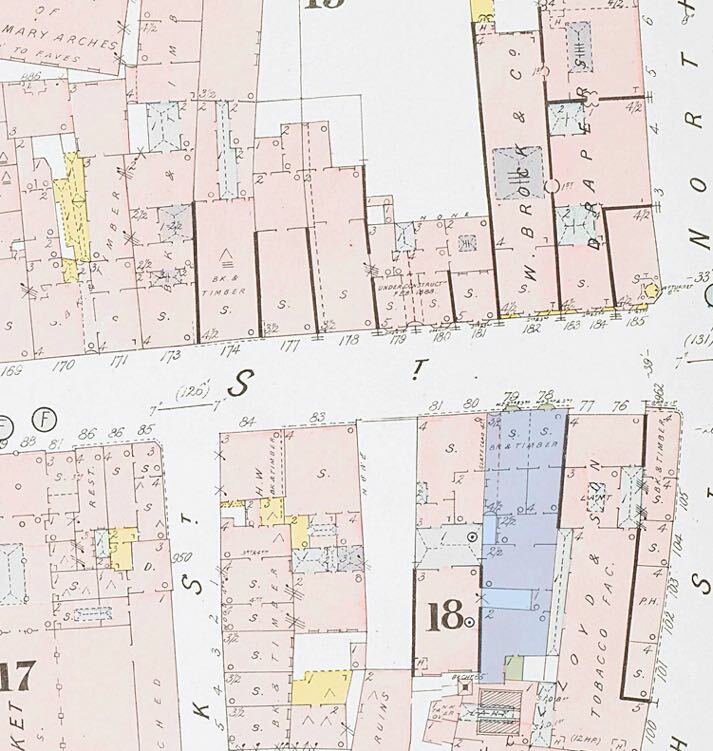 Just a year later in 1911, No 78 still contained Charles Ham, and No 79 a book shop. In 1923, the last wine and spirits merchant closed on the premises and Carr & Quick opened, selling 'The Wine of Devon', pure apple juice. The building was almost demolished in 1929, when Woolworth's, who occupied the adjacent building, tried to purchase it to build a larger, more modern store. The City Council stepped in, took out a £10,000 Government loan and purchased the building for the city. The Council's Guide for 1930, shows an advert for Ye Olde Chevalier Inn. Disaster struck when this whole area was destroyed, along with the Chevalier Inn, in the May 1942 blitz. The post war replacement, next to St George's Hall cannot be said to be a worthy successor. 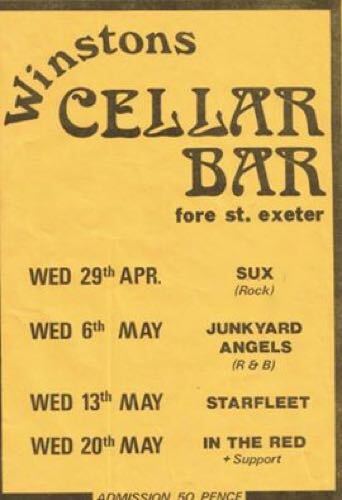 However, it is still a pub - in 1958 it was known as the Chevalier Tavern and Restaurant and during the 1970's it was Winston's, No 10's and Churchill's and became known, briefly for a weekly disco called the Rock Machine. 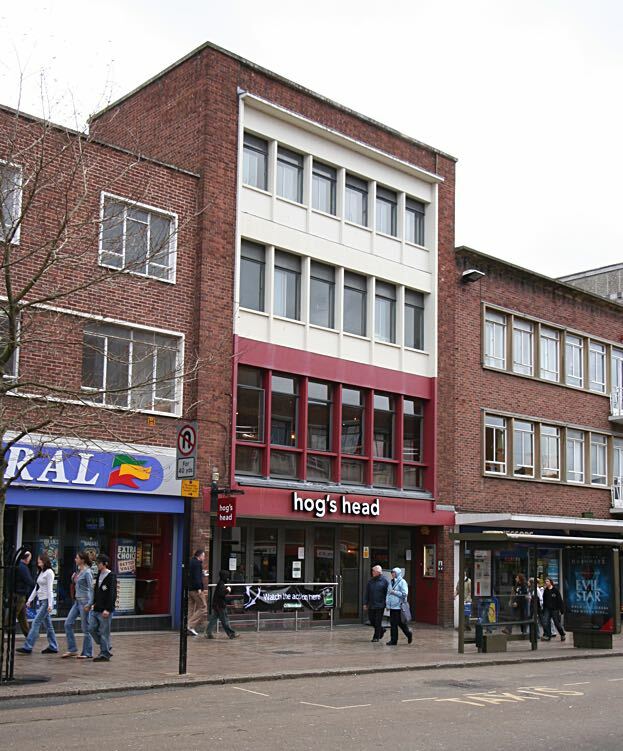 It then became the Hog's Head, a student haunt in term time. It was planned that a new equestrian statue would be placed on the roof of the Hogs Head, after a public subscription organised by local historian Todd Gray, in the spring of 2005. However, by 2009 the ceramic was still languishing in the museum. 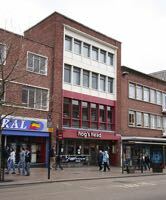 In June 2009, Tim Martin, owner of J D Wetherspoon, the pub and restaurant chain announced that they had taken over the Hogs Head, which would be refurbished. 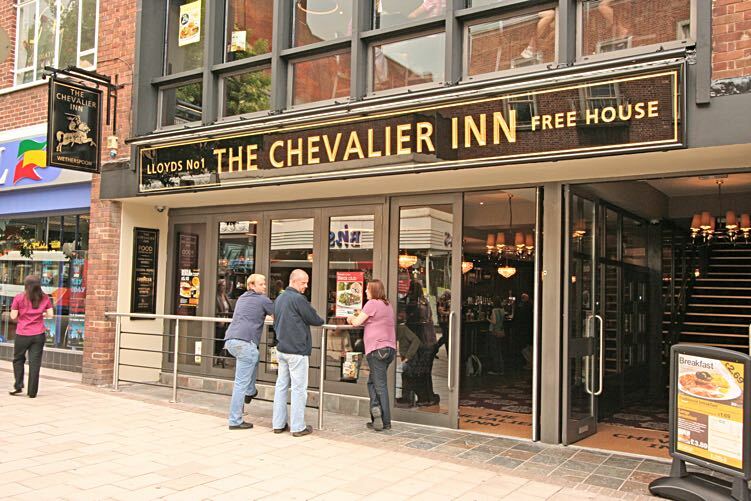 It was renamed the Chevalier Inn, a welcome return to a traditional name. Sources - Lost Exeter by Todd Gray, City Council Guidebooks (1920's, 30's, 40's and 50's), insurance maps and my memory, Old Exeter by Peter Thomas, family research by John Martin and the Express and Echo © 2005 David Cornforth - not to be used without permission. The John Gendall engraving of 1850. The house in the late 19th Century. 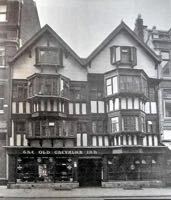 The Olde Chevalier Inn, after the City Council purchased it. The modern building on the site of the old Fountain/Chevalier Inn. This is when it was the Hogs Head. 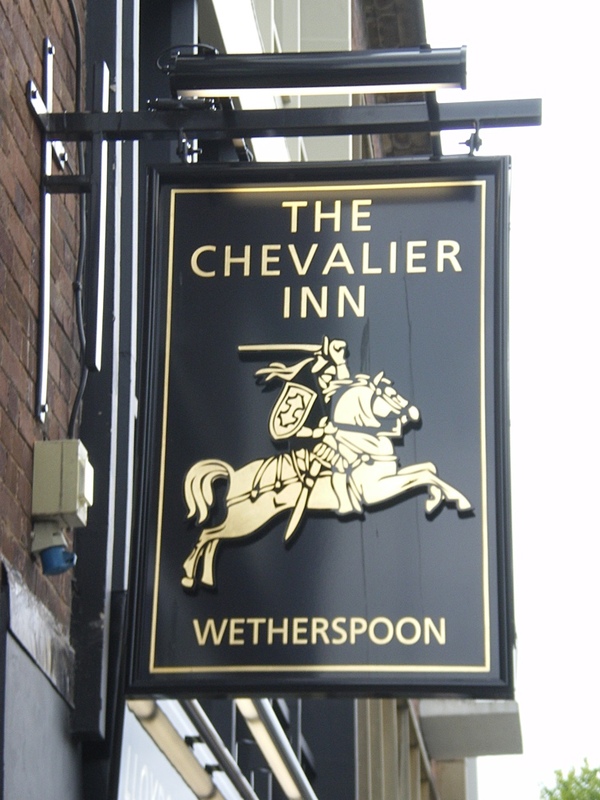 The Wetherspoon sign for the new Chevalier Inn. 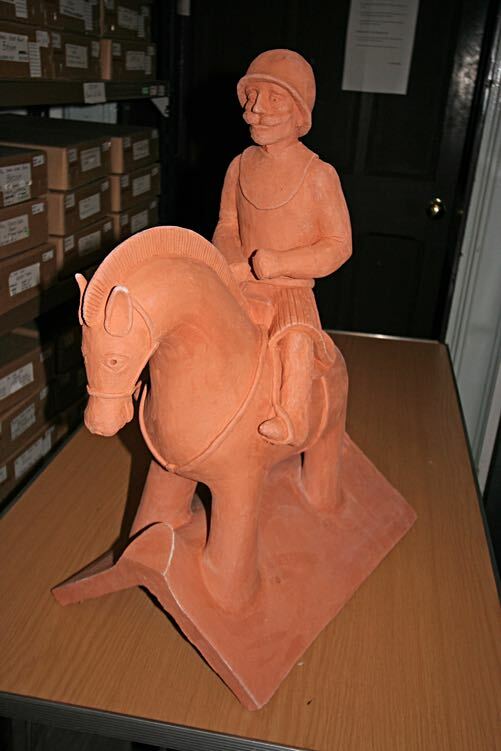 The ceramic chevalier that was commissioned to be put on the modern building. Photographed in the museum store.